Aging is accompanied by numerous changes in T cell biology. Among the most dramatic changes at the population level are the appearance and persistence of CD8+ T cell clonal expansions (TCE), whose frequency increases steadily with age, and whose biology is incompletely understood. In this study, we examined trafficking, phenotypic makeup, and homeostatic responsiveness of TCE, which arise spontaneously in specific pathogen-free mice. We show that these cells make up a specialized subset of central memory T cells with distinguishable phenotypic characteristics, most notably the higher expression of CD122 and CD127, molecules that make up IL-15R and IL-7R, respectively, than other memory T cells. We confirm that these cells proliferate at a continuous pace upon adoptive transfer into the eulymphoid recipient, unlike their non-TCE memory-phenotype counterparts, which remain undivided and die. However, upon transfer into lymphopenic recipients, TCE fail to rapidly expand, but rather resume their slow, continuous proliferation. The above results are discussed in light of possible mechanisms that afford selective survival advantage to TCE over other T cells in an aged T lymphocyte pool. Aging of the immune system is accompanied by a complex set of changes that are collectively termed immune senescence (1, 2). Immune senescence of T cells is set in motion by the involution of the thymus, which drastically curtails production of naive T cells and thereby sharply reduces renewal of the naive T cell compartment. Simultaneously, lifelong encounters with pathogens further deplete the naive compartment, and precipitate the conversion of many naive T cells into memory T cells. Consequently, there is a dramatic inversion in naive:memory cell ratio with aging. A distinct and frequent type of population shift in T cell senescence consists of the appearance of CD8 T cell clonal expansions (TCE).3 In young mammals (rodents, humans, and nonhuman primates), the percentage of T cells bearing a given family of TCRα or β chains is under tight genetic, and, most likely, homeostatic control, and is governed by the mhc and tcr haplotype, endogenous superantigen expression, and other, less well understood factors (3, 4, 5). However, with age, in all three species this regulation often breaks down and frequencies of T cells bearing different TCR V elements begin to fluctuate in an unpredictable manner, due to the appearance of large expansions of clonal T cells (6, 7, 8, 9, 10) (I. Messaoudi and J. Nikolich-Žugich, unpublished results). Large TCE are almost always CD8+, are made up of a single clone of expanded cells, and can take up to 80–90% of the murine and up to 20–30% of the human CD8 pool. Age is clearly the strongest predisposing factor for TCE appearance (8, 10, 11). Our current and incomplete understanding of TCE biology has recently been extensively reviewed (12). With regard to their dependence on antigenic stimulation, TCE can be divided into the following: 1) those believed to be responding to and are stimulated by chronic, persistent infections (particularly CMV and other herpesviruses (13)); and 2) those that are not acutely engaged in an immune response. Therefore, we will refer to them as AR-TCE (Ag-responding TCE) and AI-TCE (Ag-independent TCE), respectively. This operational classification should be used bearing in mind that Ag dependency of these two TCE categories still remains to be formally demonstrated, and that the relationship between these two TCE categories remains poorly understood. Nevertheless, large TCE affect the remaining CD8 T cells by expanding at their expense, while impacting the CD4 T cells to a much lesser extent (7, 14). Consequently, TCE reduce the diversity of CD8 T cell compartment, and, as we have shown recently, have the potential to interfere with generation of protective antiviral CD8 responses in a TCR Vβ- and Ag-specific manner (14). Although TCE expand slowly in vivo, they are difficult to maintain in vitro (15) and are not malignant, as there is no evidence that TCE can progress into lymphoma or leukemia. Consistent with this, TCE that spontaneously arise in laboratory mice were reported to lack certain markers associated with rapidly proliferating T cells, and to also lack features that would distinguish them phenotypically from other nonexpanded T cell subsets (15, 16). In this study, we investigated trafficking and phenotypic characteristics of TCE, as well as their responsiveness to homeostatic regulation. We find that TCE can be precisely characterized by a combination of certain memory T cell markers, suggesting that these cells belong to a distinct subset of memory CD8 T cells. They proliferate slowly, but continuously, regardless of the homeostatic on or off cues, demonstrating that they are largely oblivious to important environmental signals. As TCE exhibit high levels of CD122 and CD127, it is tempting to speculate that these increased levels of cytokine receptors may provide a selective advantage(s) for TCE, allowing them to efficaciously compete for survival and/or maintenance signals. Wild-type C57BL/6 (B6) animals of various ages were purchased from the National Institute on Aging breeding colony (Charles River Laboratories). Congenic B6.Ly-5.2/cr (National Cancer Institute Animal Program) and Rag-1-knockout (KO) B6.129S7Tm1-mom (17) (The Jackson Laboratory) were purchased from respective vendors. All animals were housed, and Rag-1-KO mice were also bred and housed, under specific pathogen-free (SPF) conditions in the Vaccine and Gene Therapy Institute vivarium and were used at indicated ages. All protocols were approved by, and were conducted in accordance with, Institutional Animal Care and Use Committee guidelines. Unless otherwise indicated, adult and old animals were 4–6 mo and 20–24 mo of age, respectively. Aged animals were routinely examined at necropsy, and animals bearing tumors or gross pathological abnormalities were excluded from the analysis. Animals were euthanized using isoflurane overdose inhalation. Peritoneal exudate cells were collected by rinsing the peritoneal cavity with 5 ml of PBS twice. The animals were then perfused using heparinized saline. Brain, liver, and lung were harvested and digested, as described previously (18). Spleen and lymph nodes were collected and homogenized over a steel mesh. Cells were then washed and used in assays described below. Abs directed against CD8, CD4, CD27, CD62L, CD11a, CD127 (IL-7Rα chain), CD25, CD69, CD43, Ly-6C, CD44, CD122 (IL-2 and IL-15 common β-chain), and different Vβ elements were purchased from BD Pharmingen, and were used to stain single-cell lymphocyte suspensions, as previously described (19). All samples were acquired on FACSCalibur (BD Immunocytometry Systems) or FACS LSRII (BD Immunocytometry Systems). Data files consisted of 30–200 × 104 events, acquired in the list mode, and analyzed using FlowJo (Tree Star). Markers were set so as to delimit discrete populations with fluorescence larger than that of the background of the control-stained (unstained or isotype-matched fluorochrome-labeled irrelevant Abs) samples. Gating and number of animals are described in the respective legends. Splenocytes were labeled with CFSE, as described previously (19). The cells were then injected i.v. into either Rag-1-KO or Ly-5.2 congenic recipients. Donor T cell engraftment and proliferation were followed in the blood of the recipient by FCM at the time points indicated. As TCE can comprise up to 80% of total CD8+ T cells in the blood and spleen of uninfected SPF mice, it was of interest to test migratory properties of TCE in relation to peripheral pool homeostasis. To that effect, we followed the distribution of large TCE in different organs. A representative example of this analysis is shown in Fig. 1⇓ for a 20-mo-old mouse exhibiting a Vβ5 TCE. This TCE made up 66% of all CD8+ T cells in the blood of this mouse (data not shown). We found that TCE can be readily detected in secondary lymphoid organs, such as the spleen, inguinal, and mesenteric lymph nodes, as well as in tertiary tissues such as the peritoneal cavity, lung, and liver (Fig. 1⇓). Their representation was similar to that in blood, ranging between 56 and 73% of the total CD8+ T cells in these organs. The only tissue that was largely devoid of TCE in our hands was the brain (data not shown). This is not unexpected, as several groups firmly established that activated T cells can only access brain tissue in the course of brain inflammation and the breach in the blood-brain barrier (20, 21). These migratory characteristics thus correspond to the relatively unrestricted migratory pattern exhibited by the central memory T (TCM) cells. Indeed, TCM cells are endowed with the capacity to both recirculate through blood and to home to secondary lymphoid organs in the course of immune surveillance, and to participate in surveillance of tertiary tissues that also typically attract effector and effector memory cells (18, 22). TCE have access to secondary lymphoid tissues and to tertiary sites in aged animals. TCE+ animals were identified by PBMC screening using TCRVβ and CD8 as markers, and were sacrificed, bled, and perfused with saline. Tissues were processed as in Materials and Methods, and lymphocytes from indicated sites were analyzed for the presence of the TCE by FCM and staining for TCRVβ (y-axis) and CD8 (x-axis). Numbers in each quadrant denote percentage of total CD8+ T cells with a given phenotype. Analysis of organs from an animal containing 66% of TCRVβ5 cells among its CD8+ blood lymphocytes, as well as from the indicated control animals, is shown, representative of nine TCE+, five age-matched, and four adult control animals analyzed. Variation of the percentage of TCE representation in different organs among these animals was between 78 and 116% of the values obtained in the blood, which was taken as 100%. A previous report on the surface phenotype of TCE (16) measured the expression of several early, intermediate, and late activation markers using three-color FCM, whereby Vβ and CD8 were used to gate on TCE and to analyze the expression of other activation markers. This analysis yielded no true distinguishing TCE features, and the authors concluded that TCE were CD44highCD45int-lowCD122high, with few, if any, differences between the phenotype of TCE and of nonclonal memory cells. We sought to confirm and extend this analysis using four- to seven-color FCM. To that effect, we repeated the analysis using CD8 and TCR Vβ to gate on the TCE or on the nonclonal CD8+ T cells and measure the expression and levels of CD25, CD28, CD44, CD62L, CD69, CD122, and CD127; and have extended this analysis to the expression of CD11a, CD27, CD43, and Ly-6C. As discussed by Ku et al. (16), the marker used to distinguish TCE is TCRVβ, which includes in the analysis not only TCE, but also all other nonclonal CD8+ T cells bearing the same TCRVβ segment. Our previous analysis, however, showed that large TCE, which are readily detectable by FCM, constrain other nonclonal CD8+ T cells bearing the same TCRVβ segment, such that >90% of the cells stained by the anti-Vβ mAb will belong to the TCE (19). Results from Figs. 2⇓ and 3⇓ validate this point, because between 91 and 97% of cells analyzed in this manner exhibited homogenous cell surface phenotype (Fig. 2⇓A). However, in comparing TCE with their nonclonal counterparts, it is important to compare cells at similar stages of differentiation. Furthermore, if one were to draw conclusions about the relative expression levels of certain markers, then it is exceedingly important to establish the baseline features of each population (comparing like-to-like). To that effect, we next sought to confirm that the cells, as characterized in Fig. 2⇓A, exhibit similar size/scatter properties. Fig. 2⇓B shows that forward and side scatter of TCE overlapped with those of the nonclonal subset. Therefore, direct comparisons based upon relative fluorescence intensity could be performed between these subsets. This method of gating was used in all subsequent figures to delimit the TCE+ and TCE− populations from animals bearing TCE. In all figures, except in Fig. 3⇓, we have also sought to provide direct comparisons using the same set of reagents, and therefore the TCRVβ used by the TCE was also exploited to visualize comparable TCRVβ+ populations in young adult and old control mice with no TCE. TCE have the same size and scatter as other CD8 T cells of the same phenotype. TCE were identified by analyzing PBMC for the repression of CD8 and TCRVβ (A, left). Their presence was confirmed by additional phenotypic analysis using CD44 and CD122. Forward (FSC) and side scatter (SSC) values (B) were obtained for the TCE and the corresponding CD44highCD122high nonclonal population. A representative example is shown of 25 animals analyzed. In every case analyzed, the values for FSC and SSC of the two populations were within 15% of each other. TCE have the phenotype of TCM cells. T cells from various mice were analyzed for the expression of CD8, Vβ, CD44, and either CD62L, CD11a, or CD27, or for the expression of CD8, Vβ, CD43, and Ly-6C. Results are shown after gating on the CD8+/Vβ+ double-positive population, to depict profiles of expression of CD44 and one of the other analyzed markers, to specifically focus on CD44high memory T cells. In the case of TCE− cells from an animal exhibiting a TCE, gate was set on T cells negative for the TCRVβ expressed by the TCE, as shown in Fig. 2⇑. Representative examples were shown in A, with columns representing, from left to right, young adult, old with no TCE, and TCE+ and TCE− cells from an animal exhibiting a TCRVβ7+ TCE. B, Depicts an aggregate of the analysis for 15 TCE+, 5 age-matched control, and 5 adult animals, represented as × ± SD. All values are statistically significant between TCE and any other group, with p < 0.001 by Student’s two-tailed test. We next undertook a thorough phenotypic analysis of TCE. Cells were gated as in Fig. 2⇑A and analyzed for the expression of the markers listed above. With aging, we observed an expected increase in memory T cell representation, as well as the absolute numbers. Thus, the absolute numbers of CD8 T cells in spleens of adult mice were 6.3 ± 1.83 × 106; those in old TCE+ mice had 7.74 ± 2.66, whereas those in old mice with no TCE had 7.88 ± 2.01 (n = 12/group). Given that the percentage of CD44high T cells went up from 14.33 ± 6.1 in the adult to 55.63 ± 7.62 in 20-mo-old mice, the absolute number of CD8 memory T cells clearly goes up with age in the spleens in this animal group. 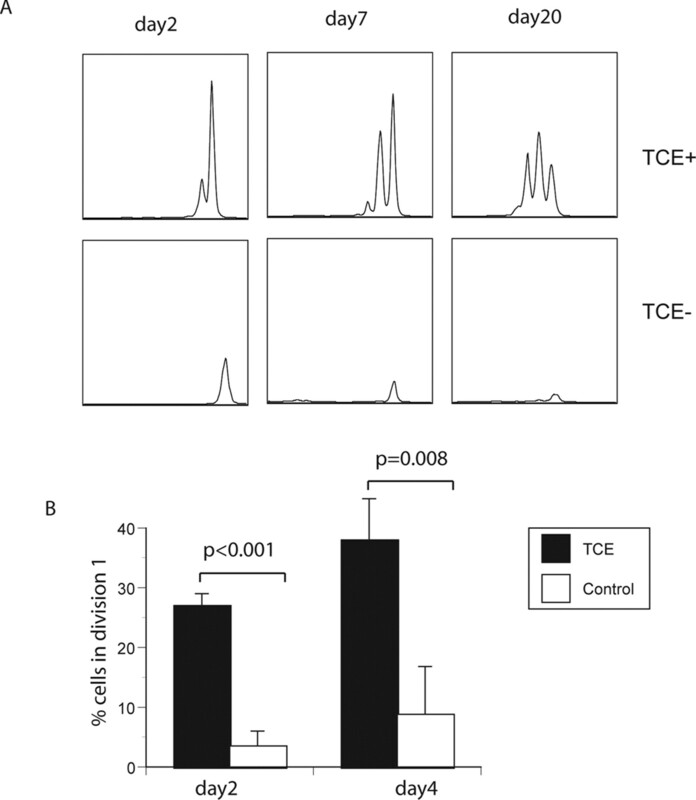 Moreover, absolute numbers of CD8 T cells were not significantly different between TCE+ and TCE− mice, confirming that the appearance of TCE does not grossly distort overall CD8 cell numbers. We next focused our analysis to TCE, which in our hands in animals purchased from the National Institute on Aging colony and maintained at Oregon Health & Science University occur in ∼30–40% of all B6 mice >20 mo of age. Consistent with the data of Ku et al. (16), we found TCE to be CD69−CD25− (data not shown). These data strongly indicate that in SPF mice, TCE are not overtly activated, and therefore probably do not participate in an actively ongoing immune response. The fact that these cells are actively cycling in vivo, based upon BrdU incorporation (I. Messaoudi, J. Warner, and J. Nikolich-Žugich, manuscript in preparation), yet bear no classical activation markers, supports this notion. Consistent with this conclusion, TCE also expressed high levels of CD11a and Ly-6C, but only intermediate or low levels of CD43 (Fig. 3⇑). Moreover, these cells did not exhibit signs of continuous, intermittent activation, as judged by their high expression of CD27 (Fig. 3⇑) and CD28 (data not shown). In both mice and humans, CD28 and CD27 were shown to be down-regulated on cells that are chronically stimulated by persisting pathogens, such as CMV (13, 23). Thus, consistent with our recently published functional and turnover analysis, we conclude that these TCE are AI-TCE, and not AR-TCE, which are characterized by expression of either acute activation markers or markers of activation by persistent, chronic infections. Finally, unlike what was described by Ku et al. (16), we found AI-TCE to be CD62Lhigh (Fig. 3⇑). (It is unclear why Ku et al. (16) observed variable and bimodal CD62L phenotype in their study, but it is possible that the TCE analyzed was contaminated by nonclonal cells, which masked their phenotype by introducing variability.) Overall, these results show that AI-TCE in SPF mice exhibit a uniform phenotype consistent with their clonal nature and with the phenotype of TCM CD8+ cells. The final part of our phenotypic analysis focused upon the expression of receptors for two major maintenance and/or survival cytokines, IL-15 and IL-7. IL-15 is the main maintenance factor for memory T cells (24), and it has been shown that IL-7, whose receptor is expressed on all naive and memory, but not activated, T cells (25), can substitute for its action in IL-15-deficient animals (26). We measured the expression and levels of IL-2/15Rβ (CD122) and IL-7Rα (CD127) subunits on CD8+TCRVβ+ cells from young adult animals, old animals with no TCE, and the TCE+ and TCE− fractions from old animals bearing TCE, using CD44 to define memory T cells. Gating was done using the TCRVβ family expressed by the TCE for young adult animals, old animals with no TCE, ant the TCE+ population in the animal with TCE; the TCE− fraction from animals with TCE was obtained by gating on the TCRVβ− fraction, as shown in Fig. 2⇑A, lower right panel. We found that CD122 was expressed uniformly on TCE, and in variable percentages on other CD8+CD44+ cells in old animals (Fig. 4⇓) (19). Moreover, levels of CD122 were significantly greater (by nearly one-third) on TCE compared with other TCM (CD44highCD122high) cells from the same animal, and also compared with TCM from control old and adult animals not bearing TCE (Fig. 4⇓). Analysis of CD127 expression on CD8+CD44+ cells revealed that a portion of these cells was negative for CD127 in both adult and old animals (Fig. 4⇓A), which is consistent with recent data in humans (27). By contrast, TCE did not exhibit such a decrease and remained uniformly CD127+ (Fig. 4⇓A). Furthermore, levels of CD127 on TCE were significantly higher on TCE than on the corresponding nonclonal TCM (CD44highCD122high) populations, as indicated by the mean fluorescence intensity (Fig. 4⇓B). These findings ascribe the CD122highCD127high phenotype to AI-TCE, and establish them as a distinct subset of TCM cells. High level expression of CD127 and CD122 by TCE. Expression of IL-7Rα chain (CD127) and IL-15Rβ chain (CD122) was determined by multicolor FCM, using the gate as in Fig. 3⇑ (CD8 and TCRVβ double positive) and by analyzing the expression of these two markers along with CD44 in adult, old, age-matched controls with no TCE, and animals with TCE subdivided into the TCE+ and TCE− fractions by gating, as in Fig. 2⇑A. Representative examples are shown in A. 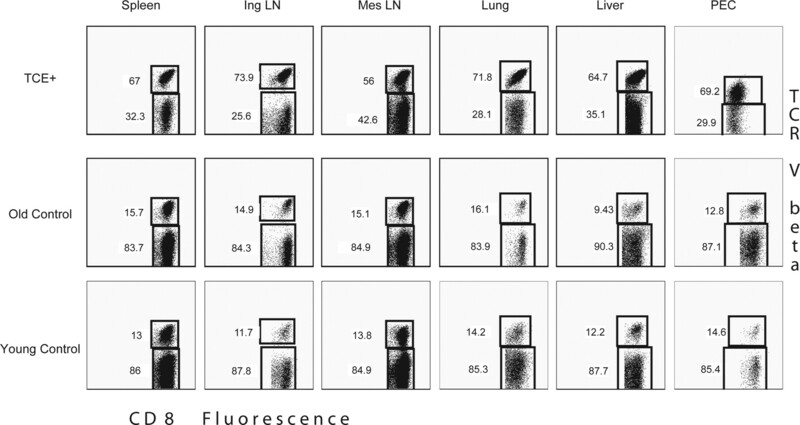 B, Depicts aggregate analysis of the animal groups from A (10 adult, 10 old TCE−, and 20 old TCE+) represented as × ± SD for percentage of CD44+CD122+ or CD44+CD127+ cells (left panels) and × ± SD of mean fluorescence intensity (MFI) of the expression of CD122 and CD127 on CD44highCD8+TCRVβ+ (right panels). All values are statistically significant between TCE and any other group, with p values indicated in the figure (Student’s two-tailed test). Our recent results (19) strongly suggested that age-related AI-TCE in SPF mice arise chiefly as the result of homeostatic proliferative expansion (HPE), because their incidence and/or the time of their onset directly correlated with the degree of lymphopenia and the increase in HPE in young adult animals, and also because we could not identify their Ag specificity, nor could we stimulate the onset of TCE using repeated administration of the same Ag. However, these experiments did not test whether TCE respond to homeostatic cues once they are established. To begin to answer this question, we tested the propensity of TCE to respond to environmental homeostatic cues. Splenocytes from TCE+ animals were isolated, labeled with fluorescein by CFSE conjugation, split into two aliquots, and one each transferred into wild-type and Rag-KO adult mice. Wild-type recipients contain normal numbers of T cells, and T cells transferred into such environment are expected to turn over very slowly, if at all. By contrast, Rag-KO animals are devoid of lymphocytes and therefore provide the opportunity for transferred T cells to divide by HPE and also in response to the commensal flora of the gut (28). Figs. 5⇓ and 6⇓ show that TCE proliferated at a similar rate under both types of conditions. Consistent with the results of Ku et al. (16), in a full, eulymphoid compartment, TCE continued to proliferate at a constant rate, whereas the remaining nonclonal T cells from the same aged mice failed to divide and eventually disappeared (Fig. 5⇓). This was not due to our inability to detect such cells, because the same number of cells was readily detectable early on in the alymphoid compartment (Fig. 6⇓A). Moreover, TCE maintained the same rate of constant proliferation in the alymphoid compartment, so that immediately after transfer (day 2) they proliferated faster than any other control cell subset (non-TCE from the same mouse or nonclonal from age-matched mice) (Fig. 6⇓A; also, compare the percentage of undivided cells on day 2 in Fig. 6⇓C, and data not shown). By contrast, on days 4 and 10, the very fast proliferation of T cells stimulated by enteric bacterial products (28) was evident in these two latter populations, and that proliferation was now much faster than the proliferation of TCE, with a substantial portion of cells undergoing >8 divisions (i.e., becoming fluorescein negative; Fig. 6⇓B). Although that division could be chiefly due to the naive cell content in these populations, it is also clear that all cells from the control, non-TCE populations ended up dividing in full, at times in which TCE cells still did not undergo the maximal number of divisions. Note that non-TCE cells from the TCE+ animals responded vigorously to enteric bacterial products, becoming nearly completely fluorescein negative by day 10 and suggesting that this population was enriched in rapidly proliferating cells, whereas control old cells from TCE− animals contained both rapidly proliferating (presumably enteric bacterial product-reactive) and slower proliferating (presumably cells undergoing HPE) populations (Fig. 6⇓, A and B). Meanwhile, TCE continued to proliferate more slowly than either the rapidly proliferating or the slower proliferating cell populations from TCE− animals (Fig. 6⇓, A and B). Nevertheless, these cells proliferated continuously, and by day 30 they again became the dominant population within the lymphopenic adoptive recipient (Fig. 6⇓D). TCE proliferate continuously in an eulymphoid compartment. CFSE-labeled spleen cells from TCE mice and age-matched controls were divided in half, and one-half (3–4 × 107/recipient) was transferred into Ly-5.2 congenic, wild-type recipients. TCE division was monitored by fluorescein dilution in peripheral blood by FCM, as described in Materials and Methods. A, Flow cytometry profile of CFSE dilution of representative animals in each group at indicated times posttransfer, gating on CD8, TCRVβ (+ for TCE+ and – for TCE− cells) and CD45.1. B, Aggregate analysis of cell division on days 2 and 4 in four animals/group, representative of two experiments. FCM gating, statistics, and data representation are as in Fig. 4⇑. TCE proliferate slowly, but continuously in an alymphoid compartment. Cells were isolated from TCE+ animals or age-matched controls described in Fig. 5⇑ and labeled as in Fig. 5⇑, and the other half (3–4 × 106 cells/recipient) was transferred into adult Rag-KO animals. CFSE dilution was determined by FCM at the indicated time points, using gating as in Fig. 5⇑ (cells from aged control animals were gated on both the total and the TCRVβ8+ cells, which was the phenotype of the TCE used in this study, and results for latter shown in A). A, Representative example of individual animals receiving slpenocytes from indicated donors. B, Percentage of fully divided (fluorescein-negative) cells is plotted as function of time for four animals/group, and results are shown as × ± SD. Note the small and likely artifactual fluorescein-negative population of cells in TCE− and control groups and also in A. C, Percentage of undivided cells on day 2 demonstrates early, albeit slow, division by TCE. Groups and analysis are as in A and B. D, Over a long time period, TCE become dominant over other T cells in an adoptive lymphopenic environment. Two TCE and one control mice are shown, representative of 10 and 5, respectively. This simultaneously meant that TCE themselves do not respond to enteric bacterial products, and that they are oblivious to signals from the lymphopenic environment that should induce HPE. Therefore, while, consistent with the data of Ku et al. (16), TCE ignore the homeostatic off signals in the full compartment, our results suggest that they also ignore the on signals from an empty compartment, and therefore appear to be following an intrinsic program of proliferation, largely independent of the homeostatic controls that govern the expansion of other T cells. It is also formally possible that TCE themselves respond to enteric bacteria products; however, that proliferation would have to be slower than that induced in any other population we analyzed in this study. TCE are a ubiquitous and widespread age-related T cell disturbance, seen in aged rodents, nonhuman primates, and humans alike (6, 7, 8, 29). Our results suggest that these cells are detrimental to the immune response to new pathogenic challenge, and understanding of their biology therefore may be important in therapy of immune senescence (14). Several germane questions remain about the origin and maintenance of these cells, and in this study we sought to address some of them. We addressed migratory properties of these cells, showing that AI-TCE were able to migrate throughout both secondary (spleen, blood) and tertiary (lung, liver, peritoneal cavity) sites, consistent with the TCM phenotype and the idea that TCM cells possess a broader range of migratory capacities than either naive or effector cells (22). We next provided a detailed cross-correlation of TCE membrane phenotype. Although our results agree with those of Ku et al. (16) that TCE are CD44highCD69−CD25−CD122highCD127+, in our hands, TCE were exclusively CD62Lhigh and we also found them to express systematically and significantly higher levels of CD127 and CD122 compared with CD8 memory cells. It is not clear what is the basis of the differences between our results and those of Ku et al. (16) with regard to CD62L, CD122, and CD127. The most likely explanation is that a mix of clonal and nonclonal cells in the analysis of Ku et al. (16) may have obscured the distinguishing phenotypic characteristics of TCE. The use of additional markers (CD44 was useful for confirmation, and we found the addition of either CD122 or CD127 to it to be highly diagnostic). Finally, we found TCE to be Ly-6ChighCD43intCD27+. Therefore, TCE can be precisely characterized by a combination of memory cell markers, and their phenotype strongly suggests that these cells belong to a distinct subset of TCM CD8 cells. Age-related TCE in SPF mice are not in the process of actively responding to Ag, as they lack both the acute (CD69 and CD25) and the intermediate (are CD43low/intCD62high rather than CD43highCD62Llow) activation markers, and also do not exhibit signs of activation by chronic, reactivating Ags (e.g., show no down-regulation of CD27). This is consistent with our recent findings (19) that most, if not all, murine TCE in SPF mice are likely to be Ag independent (AI-TCE), which contrasts them to AR-TCE that are responding to persistent viruses and are frequently seen in elderly humans. We found that memory CD8+ T cells are increased in both percentages and absolute numbers based upon the cellularity of the splenic compartment in adult and old B6 mice, supporting the previously widely reported (1, 30, 31), but perhaps somewhat less widely substantiated, age-related increase in absolute memory cell numbers. Similar results exist in the literature to support an absolute increase in memory CD8 T cells in human peripheral blood (relatively constant numbers of CD8+ T cells, but with a loss of naive and increase in memory T cells) (32, 33, 34). A caveat of these, as well as our own, studies is that only a limited number of compartments was sampled, and there is a possibility that CD8+ T cells may decline in numbers in other organs. Until a thorough study in old mice is performed, this issue is likely to remain unsettled. However, as the two major compartments containing lymphocytes seem to suggest, we believe it likely that there will be an absolute increase in memory CD8 T cells with aging. If so, this begets the question on how the compartments are regulated in aging, and what level of dysregulation may exist to allow TCE to persist. At the surface, an absolute age-related increase of memory CD8 T cells would suggest that memory and naive compartments are no longer regulated independently, as is the prevalent belief (35, 36). However, data in these two manuscripts are subject to alternative interpretations, and there are other published data suggesting that independent regulation is not universal even in adult mice (37). Moreover, regulation of the CD8+ compartment in old mice remains to be experimentally addressed. We speculate that the two compartments are not independently regulated in old age, as the system is known to operate under a paucity of naive T cells. We also speculate that this may enhance a farther demise of naive T cells, which are now blocked in proliferation by memory cells, similarly to the effects observed by Bourgeois et al. (36) in CD4 cells. This would provide fertile grounds for TCE onset and propagation. Additional experiments are clearly needed to enhance our understanding of this important issue. Upon adoptive transfer, TCE showed hallmarks of deregulated proliferation, because they proliferated at the constant rate, somewhat faster than other memory cells, regardless of whether they were studied in situ (data not shown) or were transferred into full or empty lymphoid compartment of young mice. This finding formally demonstrated that TCE fail to respond appropriately to either off or on homeostatic signals. As previously mentioned, TCE are not completely uncontrolled, because they do not proliferate in a malignant manner, and because the absolute numbers of CD8 T cells are not increased in mice with TCE. They merely exhibit a degree of independence from homeostatic controls, and our data add more information to that point. 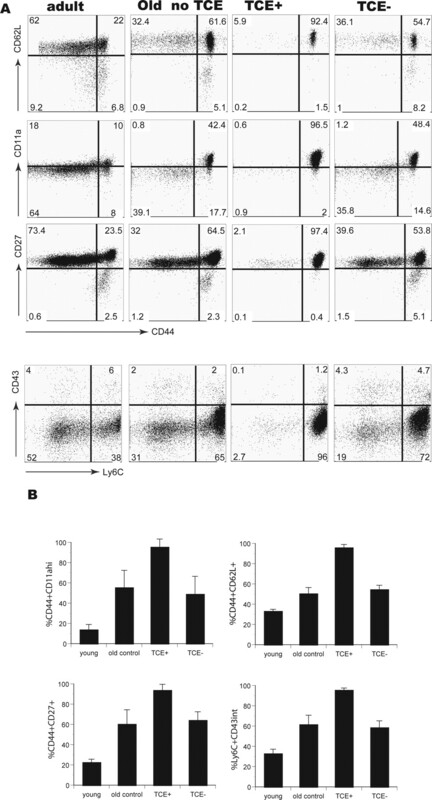 Together with the high expression of CD122/IL-15R and CD127/IL-7R, these results could be interpreted as to suggest that high levels of these two receptors may allow TCE to act as a cytokine sink, taking important maintenance signals away from other cells and ensuring their own dominance in the aged T lymphocyte pool. If so, one would expect that their response to cytokines that cause HPE could be blunted and/or may result in only low proliferation/survival signals. Testing of this hypothesis should help uncover the rules that govern population maintenance and the reasons for their breakdown in the case of age-related AI-TCE. It will be equally important to correlate these rules with the similarly obscure rules that govern persistence and deregulation of AR-TCE that respond to chronic, persistent pathogenic infection, and to begin to elucidate the relationship between these two populations. We thank Bree Fischer, Dragana Nikolich-Žugich, and Thomas Totonchy for technical assistance, and the members of the Nikolich laboratory for stimulating discussion. ↵1 This work was supported by the U.S. Public Health Service National Institutes of Health Awards AG20719 (to J.N.-Ž. ), 5T32 AI007472-10 (to I.M. ), and RR0163 (to Oregon National Primate Research Center) from National Institute on Aging, National Institute of Allergy and Infectious Diseases, and National Institute for Research Resources, respectively. ↵3 Abbreviations used in this paper: TCE, T cell clonal expansion; AI-TCE, Ag-independent TCE; AR-TCE, Ag-responding TCE; FCM, flow cytofluorometry; HPE, homeostatic proliferative expansion; int, intermediate; KO, knockout; SPF, specific pathogen free; TCM, central memory T.
Cambier, J.. 2005. Immunosenescence: a problem of lymphopoiesis, homeostasis, microenvironment, and signaling. Immunol. Rev. 205: 5-6. Marrack, P., J. Kappler. 1988. The T-cell repertoire for antigen and MHC. Immunol. Today 9: 308-315. Haqqi, T. M., S. Banerjee, W. L. Jones, G. Anderson, M. A. Behlke, D. Y. Loh, H. S. Luthra, C. S. David. 1989. Identification of T cell receptor Vβ deletion mouse strain AU/ssJ (H-2q) which is resistant to collagen-induced arthritis. Immunogenetics 29: 180-185. Behlke, M., H. Chou, K. Huppi, D. Loh. 1986. Murine T cell receptor mutants with deletions of β-chain variable region genes. Proc. Natl. Acad. Sci. USA 83: 767-771. Hingorani, R., I.-H. Choi, P. Akolka, B. Gulwani-Akolkar, R. Pergolizzi, J. Silver, P. K. Gregersen. 1993. Clonal predominance of T cell receptors within the CD8+CD45RO+ subset in normal human subjects. J. Immunol. 151: 5762-5769. Posnett, D. N., R. Sinha, S. Kabak, C. Russo. 1994. Clonal populations of T cells in normal elderly humans: the T cell equivalent to “benign monoclonal gammapathy.”. J. Exp. Med. 179: 609-617. Schwab, R., P. Szabo, J. S. Manavalan, M. E. Weksler, D. N. Posnett, C. Pannetier, P. Kourilsky, J. Even. 1997. Expanded CD4+ and CD8+ clones in elderly humans. J. Immunol. 158: 4493-4499. LeMaoult, J., I. Messaoudi, J. S. Manavalan, H. Potvin, D. Nikolich-Žugich, R. Dyall, P. Szabo, M. E. Weksler, J. Nikolich-Žugich. 2000. Age-related dysregulation in CD8 T cell homeostasis: kinetics of a diversity loss. J. Immunol. 165: 2367-2373. Ricalton, N. S., C. Robertson, J. M. Norris, M. Rewers, R. F. Hamman, B. L. Kotzin. 1998. Prevalence of CD8+ T-cell expansions in relation to age in healthy individuals. J. Gerontol. A. Biol. Sci. Med. Sci. 53: B196-B205. Pawelec, G., A. Akbar, C. Caruso, R. Effros, B. Grubeck-Loebenstein, A. Wikby. 2004. Is immunosenescence infectious?. Trends Immunol. 25: 406-410. Messaoudi, I., J. Lemaoult, J. A. Guevara-Patino, B. M. Metzner, J. Nikolich-Žugich. 2004. Age-related CD8 T cell clonal expansions constrict CD8 T cell repertoire and have the potential to impair immune defense. J. Exp. Med. 200: 1347-1358. Ku, C. C., B. Kotzin, J. Kappler, P. Marrack. 1997. CD8+ T-cell clones in old mice. Immunol. Rev. 160: 139-144. Ku, C. C., J. Kappler, P. Marrack. 2001. The growth of very large CD8+ T cell clones in older mice is controlled by cytokines. J. Immunol. 166: 2186-2193. Mombaerts, P., A. R. Clarke, M. A. Rudnicki, J. Iacomini, S. Itohara, J. J. Lafaille, L. Wang, Y. Ichikawa, R. Jaenisch, M. L. Hooper, S. Tonegawa. 1992. Mutation in T-cell antigen receptor genes β and δ block thymocyte development at different stages. Nature 360: 225-231. Masopust, D., V. Vezys, A. Marzo, L. LeFrancois. 2001. Preferential localization of effector memory cells in nonlymphoid tissue. Science 291: 2413-2417. Messaoudi, I., J. Warner, D. Nikolich-Žugich, M. Fischer, J. Nikolich-Žugich. 2006. Molecular, cellular, and antigen requirements for development of age-associated T cell clonal expansions in vivo. J. Immunol. 176: 301-308. Marten, N. W., S. A. Stohlman, W. Smith-Begolka, S. D. Miller, E. Dimacali, Q. Yao, S. Stohl, J. Goverman, C. C. Bergmann. 1999. Selection of CD8+ T cells with highly focused specificity during viral persistence in the central nervous system. J. Immunol. 162: 3905-3914. Baron, J. L., J. A. Madri, N. H. Ruddle, G. Hashim, C. A. Janeway, Jr. 1993. Surface expression of α4 integrin by CD4 T cells is required for their entry into brain parenchyma. J. Exp. Med. 177: 57-68. Scimone, M. L., T. W. Felbinger, I. B. Mazo, J. V. Stein, U. H. von Andrian, W. Weninger. 2004. CXCL12 mediates CCR7-independent homing of central memory cells, but not naive T cells, in peripheral lymph nodes. J. Exp. Med. 199: 1113-1120. Baars, P. A., S. Sierro, R. Arens, K. Tesselaar, B. Hooibrink, P. Klenerman, R. A. van Lier. 2005. 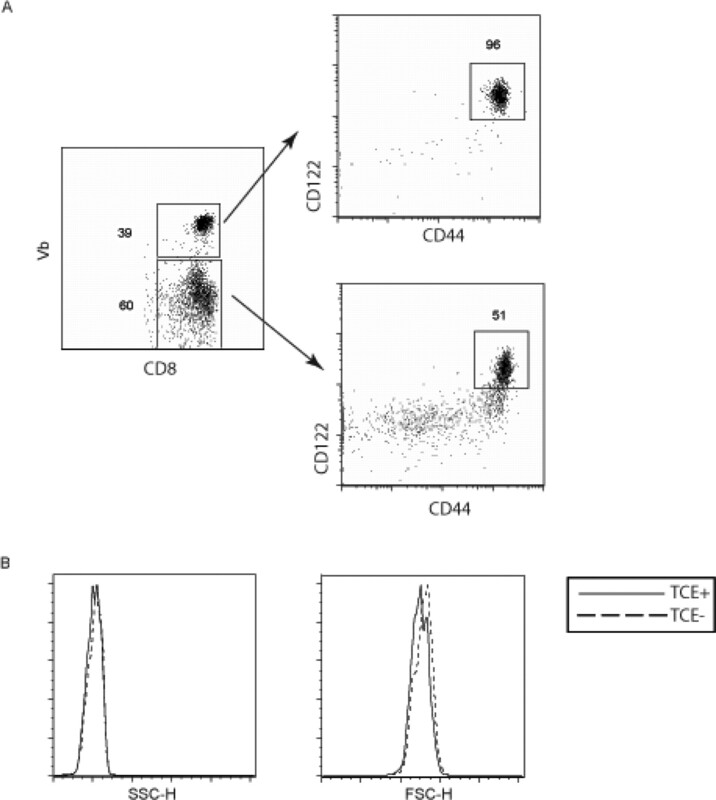 Properties of murine CD8+CD27− T cells. Eur. J. Immunol. 35: 3131-3141. Kieper, W. C., J. T. Tan, B. Bondi-Boyd, L. Gapin, J. Sprent, R. Ceredig, C. D. Surh. 2002. Overexpression of interleukin (IL)-7 leads to IL-15-independent generation of memory phenotype CD8+ T cells. J. Exp. Med. 195: 1533-1539. Kim, H. R., M. S. Hong, J. M. Dan, I. Kang. 2005. Altered IL-7Rα expression with aging and the potential implications of IL-7 therapy on CD8+ T cell immune responses. Blood 107: 2855-2862. Kieper, W. C., A. Troy, J. T. Burghardt, C. Ramsey, J. Y. Lee, H. Q. Jiang, W. Dummer, H. Shen, J. J. Cebra, C. D. Surh. 2005. Recent immune status determines the source of antigens that drive homeostatic T cell expansion. J. Immunol. 174: 3158-3163. Koetz, K., E. Bryl, K. Spickschen, W. M. O’Fallon, J. J. Goronzy, C. M. Weyland. 2000. T cell homeostasis in patients with rheumatoid arthritis. Proc. Natl. Acad. Sci. USA 97: 9203-9208. Linton, P. J., K. Dorshkind. 2004. Age-related changes in lymphocyte development and function. Nat. Immunol. 5: 133-139. Nikolich-Žugich, J.. 2005. T cell aging: naive but not young. J. Exp. Med. 201: 837-840. Aspinall, R., J. Carroll, S. Jiang. 1998. Age-related changes in the absolute number of CD95 positive cells in T cell subsets in the blood. Exp. Gerontol. 33: 581-591. Nilsson, B. O., J. Ernerudh, B. Johansson, P. E. Evrin, S. Lofgren, F. G. Ferguson, A. Wikby. 2003. Morbidity does not influence the T-cell immune risk phenotype in the elderly: findings in the Swedish NONA Immune Study using sample selection protocols. Mech. Ageing Dev. 124: 469-476. Gregg, R., C. M. Smith, F. J. Clark, D. Dunnion, N. Khan, R. Chakraverty, L. Nayak, P. A. Moss. 2005. The number of human peripheral blood CD4+CD25high regulatory T cells increases with age. Clin. Exp. Immunol. 140: 540-546. Tanchot, C., B. Rocha. 1995. The peripheral T cell repertoire: independent homeostatic regulation of virgin and activated CD8+ T cell pools. Eur. J. Immunol. 25: 2127-2136. Bourgeois, C., G. Kassiotis, B. Stockinger. 2005. A major role for memory CD4 T cells in the control of lymphopenia-induced proliferation of naive CD4 T cells. J. Immunol. 174: 5316-5323. Tan, J., B. Ernst, W. Kieper, E. LeRoy, J. Sprent, C. Surh. 2002. Interleukin (IL)-15 and IL-7 jointly regulate homeostatic proliferation of memory phenotype CD8+ cells but are not required for memory phenotype CD4+ cells. J. Exp. Med. 195: 1523-1532.